I’ve recently started something new. I’ve started collecting bread from a nearby bakery. I’m not talking 1-2 loaves of bread, or even 8-10. I think I’ll just show, instead of tell. This was the last day I arranged bread in a normal, boring fashion. This is about 100+ buns. A spiral containing about 110+ buns. 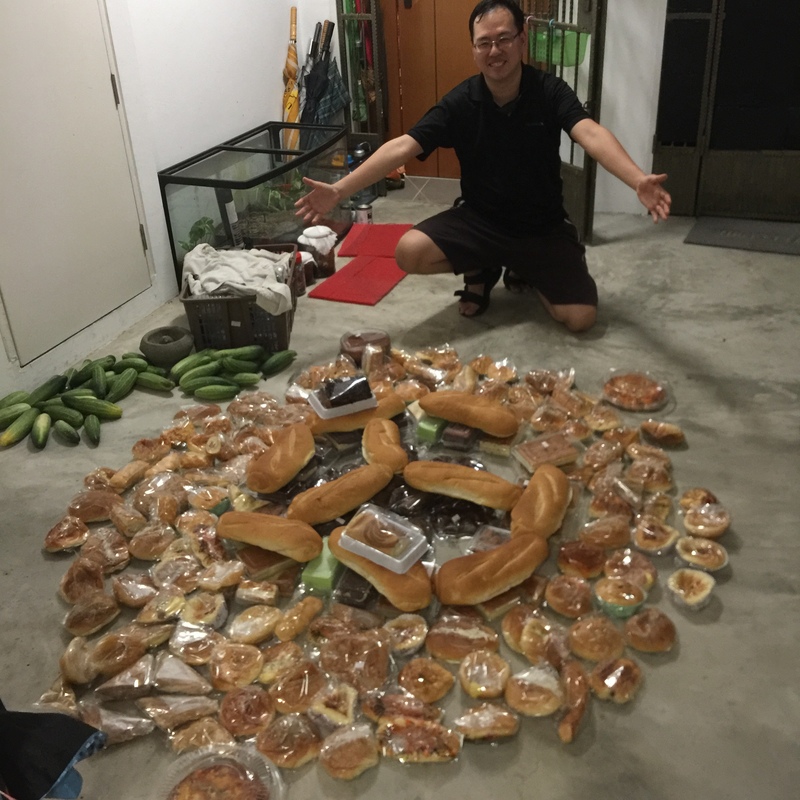 The Singapore flag, made of about 90 buns. A smaller collection of about 50 buns fashioned into a Tao. This larger collection of 190 buns formed, well, a flux capacitor. About 100+ buns makes a dumpster. A Christmas tree, made up of about 50+ buns. A jellyfish made of about 170 buns. A high heel shoe made of about 50+ buns. Pac-man chasing a ghost, made of about 150 buns. Arkanoid, made of about 150+ buns. A palm tree, about 70 buns. A star made of about 70 buns. A white space question mark made of about 150 buns. A year-end message, made of about 70 buns. I also have some collections that are not in this exhibit. In total, I have collected about 2,000 buns, cakes and pizzas from a single bakery in the past 3 weeks. So the next question is, what did I do with them? What do freegans with lots of stuff do? We give them away. I gave it to members of the community who, in turn, fed their families, neighbours, homeless and the less fortunate. I worked out that since I collect about 100 buns a day, if I did this every day for a year, I would have rescued over 30,000 buns from the incinerator.